Who is ready to be inspired today? In case you didn't catch the first post of the Fit Bod, Fun Life series, let me introduce you to my amazing healthy living guru friend, Mariah Secrest-Comer. She is a certified personal trainer, has a busy lifestyle, and still finds time to care for herself. She quite simply loves encouraging people to be their best self, so I knew you would love hearing from her! I've asked her to create a series of attainable easy healthy living goals for working women on the go (aka: US! ), so she is back with this awesome week 2 installment of Fit Bod, Fun Life. I love this week's challenge - I definitely think I can do this! Did you ever think the phrase, “How do you eat an elephant? One bite at a time.” was a little strange? Who the heck wants to eat an elephant? Why would they? Is this elephant related to the “elephant in the room”? Should we be calling PETA? I digress (already). I actually started to Google the phrase’s origins, but that won’t help for today’s purposes. Last week in the Fit Bod, Fun Life series, we talked about Finding Your Fitness Sweet Spot. If you want to be successful in sustaining a fit life, you have to be super clear about what you want, why you want it, and how much you are and aren’t willing to give up for it. Did you do your homework and write those things out? If not, you can take a quick break from reading to just share in a comment below—that will count! The next step in acquiring a shiny new fitness lifestyle should be a bit of a relief. There are so many promises out there. So many workout theories, programs, classes, videos, studios, gyms, books, apps, fitness trackers, workout logs, memberships, trainers, gadgets, pills, supplements, powders, shakes, equipment—all claiming to have the ultimate secret. I’m going to tell you my ultimate secret right from the get-go, for free, and it’s SUPER SIMPLE. Really. Just start moving 20 minutes a day. That’s it. Trust me. If you’re not already moving your body in a way that elevates your breathing and heart rate for 20 minutes a day, just do it. Every. Single. Day. It doesn’t have to kill you, or make you miserable. It would be better, in fact, if it didn’t. It would be fantastic if you actually enjoy what you’re doing—walking your dogs, or splashing in a pool, or cruising to your playlist on an elliptical machine, or shaking it at a dance party, or riding your bike, or trying out a new class, or trying some of the home-based exercises from fitness magazines like Self and Shape. The best workout in the world means nothing if you don’t do it consistently. And the reason that most of us start new workout programs and fail to stick with it, is because the new habit is too different from what we’re accustomed to (either too hard, or too time-consuming, or too competitive, or too tricky to schedule, etc.). But anyone can move 20 minutes a day—even if it’s doing squats while you brush your teeth, jumping jacks while you wait for your coffee to brew, and push-ups while your breakfast is in the microwave. Here’s the other thing to keep in mind…for the first month, focus on how you feel, not on how you look. And you will. But not until you’re consistent. We can—and will—add the results-oriented swaps later. We’ll start to talk interval training, muscle overloading, carbohydrate-blocking. But a lot of that will start to happen naturally (fancy terms aside). As you’re consistent with your movement, your body will start to adapt and crave more of a challenge. You’ll naturally want to push it a little longer, or a little harder. Most importantly, you’ll have developed a positive association of exercise, which will keep you hooked for years to come. And to make it even easier and more fun, why not let me personally guide you through the first two weeks? Creating accountability around those fundamental building-blocks of consistency is what my free program 14 Days toFit is all about. Some of you have already signed up—yay!—but if you haven’t, you can do it right now by clicking on the button below. Because we do this together, we are already a couple days into it, but you’ll catch up in no time! Just shoot me an email at info@elevatemobilefitness.com after you sign up, and I’ll forward you the first couple days’ worth of material! Thanks so much, Meg, for inviting me into your space. Have a fit, fun week everyone - see you next week! This is one thing I've been trying to work on. It can be so hard when my schedule gets crazy, but this helps me work towards consistency. Something so simple yet we seem to make it so difficult sometimes! I'm going to try my best at achieving this goal every day! I'm so proud of you for setting that goal, Ashley. Can't wait to hear how it goes! 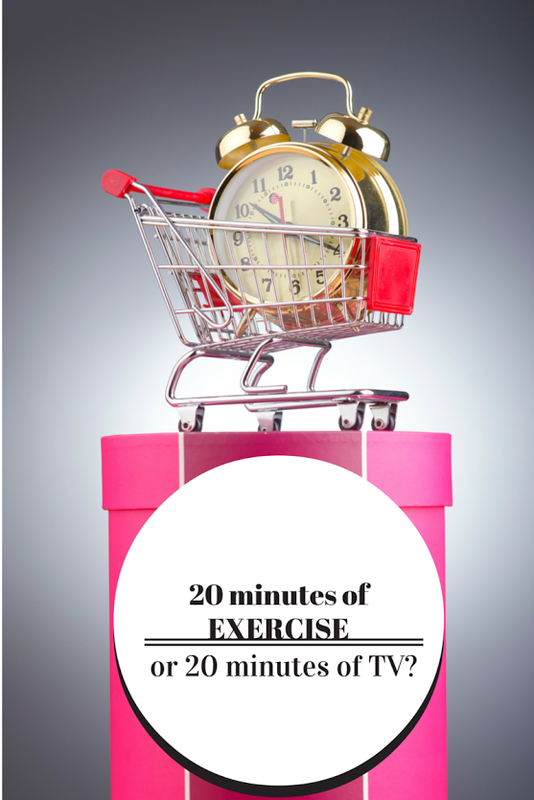 I love that-the 20 minutes a day and how it positively impacts our overall habits. It's difficult sometimes to commit to an hour every day (though I've gotten good about it) but 20 minutes is definitely attainable!! I hear you! I always feel like it isn't worth it if I can't do a full 45-60 minute sweat sesh at minimum, but I like the idea of just move for 20 minutes every day! I couldn't agree with you more! I should be proud of myself whether I move for 20 minutes or for an hour and 20 minutes. Every little bit helps making it a lifestyle! Yes! I agree! Sometimes at the end of a long work day, working out for an hour seems so overwhelming and daunting. But if I can just do a simple 20 minutes, that's definitely a goal I can work to conquer easily!